According to Subhra Jain, a freelance reporter in New Delhi, she bumped into a very senior Indian Military official at a nightclub in New Delhi. While talking what she came to know will make the rest of the world sit up all night. According to her, Extra Terrestrials have been visiting India and the rest of the world for thousands of years. In recent days most of the super powers have been formally contacted. They always contact through the ground radar stations of the military’, she says. Indian Himalayas and Ladakh (China-India) border is where they first made their recent contact. They want to let India know the laws and regulation of the multidimensional Universe. India’s premier Space Research Organization (ISRO) was given do's and dont's for India's unmanned moon mission (Chandrayaan-1) and an unmanned Mars expedition planned for later. 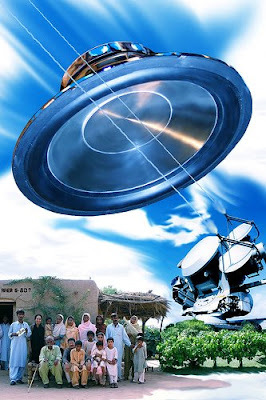 Since India joined the Nuke Club, Extraterrestrials have been frequenting the Indian skies and the evidence lies in the multiple sightings that take place every day in many parts of India. While most cases go unreported there are some rare videos of these highly advanced light ships doing their thing materializing, dematerializing, splitting in two or more and then merging as one ... the same phenomena has been reported at thousands of UFO sightings all over the world by totally amazed onlookers. These advanced space crafts can jump dimensions, become invisible, change shape, size and luminosity at will ... the crafts are consciously controlled by the beings aboard who are masters at operating Spiritual Technology and travel through the universe in the blink of an eye, popping in and out of worlds. There is so much out there that exists but is simply invisible to the human eye because we see only within the visible spectrum and there are many other invisible dimensions which are now beginning to thin.